﻿I have mixed feelings about garden furniture. Part of me says I ought to go and buy some more upmarket stuff (probably made of hardwood). But another part of me says: "Hang on. Because of our dismal weather last year we only ate a meal in the garden twice. Is it worth buying what might be some pretty expensive furniture just for that?" I also like to use my garden table as a place to put my young seedlings out of harm's way when I'm hardening them off, and I might have some reservations about doing this if I had a posh table. 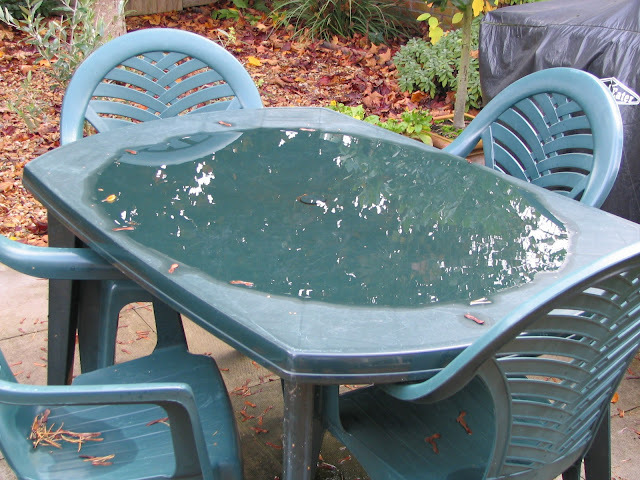 I also have no hesitation about leaving the plastic furniture outside over the Winter. If it were to be damaged, it would not cost me a lot to replace it. Actually, it's so lightweight that there's a strong likelihood that it might be blown away in a gale! If I had more substantial wooden furniture I would feel obliged to move it under cover (where, exactly? The garage is already full) during the Winter, or at least provide it with waterproof covers (at additional expense). It's a dilemma, isn't it? What would you do? It's from the recipe in Hugh Fearnley-Whittingstall's book "River Cottage everyday". It's a type of soda bread or damper - quick and easy to make and and utterly delicious, especially when served still warm from the oven. We had ours with a bowl of lightly-curried lentil soup, made with lots of swede turnip. Since the bread has cheese in it we were a bit worried that it would clash with the curry flavour, but they actually went very well together. The dominant flavour in the bread was the parsnip, since it was made with some of the wonderfully fresh organic parsnips from our Abel and Cole veg-box. The cheese and parsnip in this bread make it a nice moist texture, much less dry than many soda breads. I should think it would be good with onion marmalade or some of Green Dragonette's amazing Tomato, Pumpkin and Balsamic chutney (as well as a good hunk of Cheddar cheese). Hugh F-W advocates spreading lots of butter on it, but if you're going to do this I suggest softening the butter beforehand since the bread is quite crumbly. ﻿We only ate half of the loaf at the first sitting. We wrapped the other half in some tinfoil and ate it the next day, warmed-up in the oven. It wasn't quite as nice second time round, but it was still very good! The weekend had a bit of a swan theme: we stayed in hotels called "The Swan's Nest" and "The Old Swan and Minster Lovell Mill", so what could be more appropriate to start this collection than a photo of a swan? Whilst posing a shot of a bridge in Shipston upon Stour, I saw this impressive fungal growth on the tree against which I was leaning. Anyone able to identify it? The whole Cotswold area uses the drystone walling technique for enclosing agricultural fields. It's an ancient skill that is becoming rarer these days, when it's quicker and less costly just to string up a few posts and a bit of barbed wire. In the hotel at Minster Lovell they had several of these fabulous (and no doubt hugely heavy) plant-containers which are re-purposed drinking troughs for livestock, made from hand-hewn stone. I think they are really great, but there's of course no way I could fit one into my little garden. I was also very taken by these ornamental "mushrooms" - each one of which is effectively a miniature garden, covered as they are with mosses and lichens. This is one of the lamps outside the hotel entrance (powered by electricity these days, but probably originally made to use oil). I couldn't really capture the light effect as I would have liked. The afternoon sun was making these things absolutely sparkle, even though the lamps were not yet switched on. I like the ripple effect on the water here. This is the River Windrush that used to power the mill at Minster Lovell. Since I'm English, this wall-decoration in one of the hotel corridors appealed to me. The area of Minster Lovell is steeped in history - particularly in relation to what we called the War of the Roses, in which the houses of York and Lancaster vied for supremacy over a very long period. This is a Contorted Hazel bush at the side of a car-park (not a garden as such). Isn't its complexity fascinating? What do you see in this picture? A large-scale pan-scourer? The head of Marge Simpson on a Bad Hair Day? Or what? OK, this one is on my Wishlist now - officially an "orangery", but just think what you could grow in that! This one probably doesn't need any explanation. Eggs. Although, not being an expert in such things, I couldn't conclusively say what laid them. They look to me like Goose eggs. How would I know? I like the different textures of tree bark. This one is almost like scales. I will admit that I do not know what this flower is. I thought at first that it was Celandine, but on closer inspection I changed my mind. I could go and look it up with the aid of Google, but I'm sure someone will save me the effort! This is an interesting way of making a small hedge. These Dogwood branches started off by being a low step-over fence made of twigs bent into semi-circular shape and pushed into the ground. Now they have sprouted and are putting up new, vertical, shoots. In a year or two this could be a very substantial fence. Dogwood roots very easily doesn't it? In my garden I have a "bird-feeder" in which I put seeds and nuts for the birds to eat. Unfortunately my local squirrel population don't seem to have bought into the concept, and they see the device as being fair game. Unlike birds, squirrels can't fly, so getting at the nuts is more difficult for them. In the past I had some bird-feeders with plastic fittings and the squirrels found it easy enough to bite through the plastic to get at the nuts, so now I have one with metals fittings. The squirrel is an ingenious animal though so this hasn't deterred them. They just have to resort to a few physical contortions to get what they want. For instance, can you scratch your ear with your leg, whilst perched high in a tree, balancing on a tiny bough??? Squirrels can. Can you hang upside-down, holding onto a branch with your legs? Squirrels can. To be honest, I'm not too fussed about the squirrels nicking the odd few seeds and nuts - just as long as they don't monopolise the scene and take everything, leaving the birds with nothing, so I occasionally shoo the squirrels away if I see them wading in too enthusiastically. The period right at the end of Winter when most of the hardy vegetables have been consumed, and before any of the Spring vegetables are ready is often referred to as "The Hungry Gap". Before the days of international air-freight this used to be a time when fresh vegetables were scarce. If we were relying on my garden as a source of fresh veg right now we would definitely be hungry. Fortunately Jane has won a prize which convincingly closes the Hungry Gap for us (Brilliant timing, Jane!). The prize is a large box of fresh vegetables every week for three months, delivered by Abel and Cole. We are on our third week now and have been really impressed with the arrangement. Abel and Cole have been very efficient with their administration; their delivery drivers are prompt and courteous; and above all else the vegetables are excellent. The box always includes the three staples of potatoes, onions and carrots, but the other contents very according to what is in season and/or what is available (not all the items are locally-grown). The contents of each week's box is published on the Abel and Cole website, and you then have 48 hours to indicate whether there is anything you don't like/want, and arrange a substitution. (They even send you an email to remind you to do this!) You can also indicate any veg that you never want, and any veg that you particularly like (which is borne in mind when substituitions are made). If you were to buy these boxes they would cost you £18.50 each, which includes delivery. Naturally there are several different sizes available, at different prices. The Large one is supposed to feed 4 people for a week, though I think if they were four people like Jane and me, then the box might perhaps be a little on the skimpy side. The quality and freshness of the vegetables though is first class. There are some other aspects of Abel and Cole's service that we also like. For instance the smaller, more delicate veg are supplied in recycleable/compostable carboard containers (hooray, no plastic! ), and the big cardboard box in which everything is delivered is easily folded up for storage until the following week, when the delivery driver will take it away for re-use. Although it is unlikely, simply because we have a lot of home-grown veg, that this prize will convince us to purchase a regular weekly veg-box, I think we might be very tempted to have three months' supply every year to fill the Hungry Gap, and I have no hesitation in recommending the service to anyone who does not grow their own. Thank You, Abel and Cole, for a really lovely prize! Flower Sprouts - we finally get to taste them! A couple of days ago the long-awaited Moment of Truth arrived: we ate the first of the "Petit Posy" Flower Sprouts! "What were they like?" I hear you asking. Well, they tasted OK but unremarkable. Nothing to write home about, as they say. Quite similar to Brussel Sprouts, though very mild. The texture was like that of young Cabbage. This new vegetable is a hybrid of Brussels Sprouts and Kale, allegedly giving the best of both, but I'm not convinced. I think I would rather have the two parents, separately. ("If it ain't broke, don't fix it"). I have to report that I am also totally unimpressed with the VSR of "Petit Posy". (VSR is Value for Space Rating). The seeds for these plants were sown in the third week of April so they have been occupying space for the best part of ten months. After all that time the yield was laughably small. On this occasion I cut one whole plant. Here you can see it next to a pair of secateurs, just to give you an idea of its size. Unlike the non-F1 varieties of Brussels Sprouts, all the Petit Posy sprouts develop simultaneously, but even so, this one only yielded enough sprouts for a modest two-person serving. Well, I reckon Flower Sprouts score highly on the last one, simply because I have never seen them on sale anywhere. They also score some points for 3, and possibly 4 (because it's difficult to compare them with shop-bought ones when such things are not available!). On criteria 1 and 2 - zero points, or nearly so! To be perfectly honest, I don't think this vegetable is worth growing. Straightforward Brussels Sprouts are better. P.S. I'm still having big problems leaving comments on lots of blogs. It's all to do with the blessed word-verification. I have found that some of them work and others don't. If you have the method that opens a new window for comments, that's normally OK, but often when you have the "Embedded below post" option it doesn't work. I have removed word-verification from my blog altogether, and I hope that others will do the same. This post describes the second half of our recent weekend away, and follows on from the one about Stratford on Avon. Those of you who don't know this area might care to follow this link to the website of the local Tourist Board. After leaving Stratford on Avon we drove south through Shipston on Stour, Chipping Norton and Charlbury, eventually arriving in Witney, from where it was only another couple of miles to our destination in the village of Minster Lovell. We had arranged to stay in a hotel called the Old Swan and Minster Lovell Mill. It is a property in two parts - the 600-year-old Old Swan pub(lic house), and the slightly more recent Mill. The hotel sits in 65 acres of beautiful grounds, centred on the swiftly-flowing River Windrush, which used to provide the power for the corn mill. These days the area adjacent to the old mill-race is an outdoor seating area where (in suitable weather conditions) visitors can partake of sumptuous cream teas and cool glasses of Pimms and other such quintessentially English delights. The grounds of the hotel also have lots to interest the keen gardener. There is a veg patch and herb garden, ( relatively bare at this time of year) and even a whole flock of hens. The hens are rescued battery birds. Their eggs are regularly served in the hotel, and you can even (as we did) buy some to take home with you. Young children staying at the hotel are allowed to go out and collect "their own" egg, which is then served to them at breakfast time! They have a greenhouse that is so ancient that it even has a thatched roof:! Actually, I think the roof-covering is a cunning way of ensuring that plants inside don't get scorched. Who do you think arrived in this particular helicopter? Look at the registration letters: G-WAGS! [For the benefit of the non-British audience, the abbreviation WAGS is in common usage here to signify "Wives And Girlfriends" - usually of sporting 'personalities', particularly footballers.] I didn't see who this one belonged to, but I'm not a star-spotter so I don't really care! I nearly forgot to tell you about our whole reason for being at the hotel. We had been attracted by their "Sunday Sleepover" deal. For a mere £195 it included genuinely luxury accommodation for two people, cream tea in the afternoon, a 3-course dinner in the evening, and full English breakfast on the Monday morning. And allegedly a glass of champagne each before dinner. This never materialised, but when we queried it (after dinner) we were given glasses of cognac instead, which suited us fine, since we are not all that enamoured with champagne. Dessert: Creme Brulee (intriguingly flavoured with cloves instead of the usual vanilla) with home-made shortcake and a raspberry coulis. The meal was really nice. Not hugely cheffy, but very good of its kind - effectively Gastro-Pub style. For me it was only slightly marred by finding a couple of small rabbit bones in my terrine, but that was a very minor issue. The star of the show was actually the vegetable medley. It included roasted parsnips, carrots and swede turnip, steamed leeks, poached mushrooms and even some spinach (presumably added at the last minute). All the veg were cooked exactly right - not soft and soggy, but also not squeaky or crunchy. Perfect. This is all the more surprising when you consider that most steak dishes tend to be served with a rather pathetic salad which is little more than a garnish, and some unexciting French Fries. This post has already gone on far too long, so I had better not write about the Full English Breakfast... Suffice it to say that it was also an excellent example of the genre. Fantastic sausages; good local bacon; eggs from their own hens, etc. We had on two consecutive days what would appear (on paper) to be exactly the same breakfast, but for us it was No Contest. The one in the chain hotel in Stratford was OK, but the one at Minster Lovell was better by a mile. Anyway, that was our weekend. I hope yours was just as enjoyable. We chose this as our first stop primarily because Jane had won a night's accommodation in the Swans Nest hotel, a solid red-brick 17th century edifice situated right next to the river Avon, in a very convenient position. The hotel is right next to the southern end of the impressive 14-arch Clopton Bridge, allegedly built in 1480 on the site of an earlier wooden bridge which had been built to "upgrade" the ford which originally gave Stratford its name. Directly opposite the hotel, a five-minute walk away, is what most visitors to Stratford come to see - the new Royal Shakespeare Theatre, completed only in 2010. We didn't do this, but apparently you can up inside that tower to a viewing gallery from which there are spectacular views of the town. On another occasion we also might have opted to see a play, but on this occasion that was not the plan. Right next to the theatre is the canal basin (terminus) of the Stratford on Avon canal, which runs for only 25 miles, connecting the Grand Union Canal at Birmingham to the River Avon at Stratford. Surprisingly (considering the hilly nature of much of our country), England has an extensive canal network, which was established in the late 18th century, when the Industrial Revoloution demanded a means of transporting raw materials and finished goods in unprecedented quantities. At that time the road system was very poor, and the horse-drawn wagon was a very inefficient way of moving goods. The canals changed everything, permitting the movement of bulk goods in much shorter timescales. Our canals were never very wide, and a special type of boat was built for them. We call them "Narrow boats" - for obvious reasons. These barges were originally towed by horses which trudged along the "towpaths". These days the boats have mostly been converted for leisure use, being fitted out with motors and sleeping accomodation etc. A canal-based holiday is still a slow-moving option, because of the large number of locks that need to be negotiated, For instance, on the 25-miles-long Stratford canal there are 54 locks! Despite the huge investment that went into constructing the canal network, its usefulness was very brief, simply because the railway soon replaced the canal as the main means of transport - and was able to move materials at a speed which far surpassed that of the poor old horse. Our opportunities for tourism were strictly limited this time, for a variety of reasons, not least of which was the weather. In the early afternoon we had some amazingly heavy rain - the sort we call a "tropical downpour". Just look at the colour of the sky in this next photo, taken looking right into the sun!